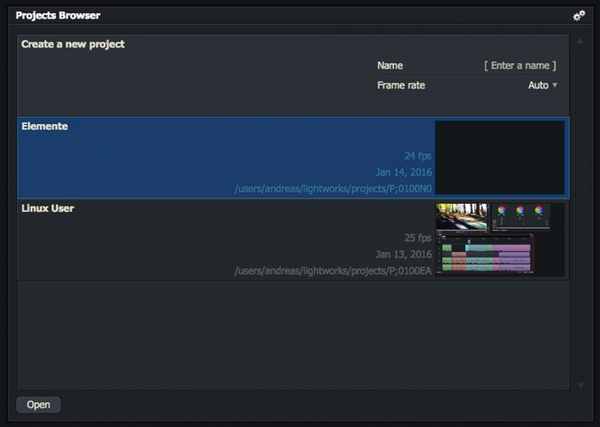 The video editing software Lightworks  organizes files into projects. Creating a corresponding directory at the filesystem level to access video, audio, and image files will avoid problems later. If you copy any material to this new directory that you will want to use later, you will be able to access it quickly and easily via the Import dialog. You don't need to give too much thought to the file formats, because Lightworks supports a wide range from the professional and consumer sectors . However, the output format depends on the software version you are using (see the "Versions" box for more information). Two versions of Lightworks are available: Free and Pro. You can choose to buy a subscription or purchase the software outright for the Pro version. The price for the subscription is $24.99 per month or $174.99 per year. Purchasing a license outright costs $437.99. The main difference between the Free and Pro versions is the export options. The Free version only creates MP4/H.264 videos with a resolution of 720p. The Pro version supports more video formats, diverse formats for exchange with editing systems and cameras, and direct Blu-ray and DVD export. Lightworks Pro also provides some special options for editing. Lightworks is organized into various levels – with the top level called the project (Figure 1). On startup, a dialog appears either displaying existing projects or prompting you to create a new one. You just need to enter a name in the text box, possibly supplemented with a particular frame rate – the default here is always Auto. Figure 1: Lightworks organizes the work into projects – and you can work on several projects at once. The application keeps track of all media, settings, and the window arrangement. The interface initially appears to be clearly organized. You will see just one small field with a few icons on the left-hand edge (Figure 2). The second symbol from the top is for the Import function. Here, you will the find the Places entry, which lists some default directories, as well as local and removable media. Figure 2: Lightworks initially requires only a minimal set of commands. You can access all other options using keyboard shortcuts, the settings in each window, or context menus. At the bottom of the window, you will see the Create Link entry. Here, you can set whether the software copies the selected files to a local directory or leaves them in their storage location. Now, you can select a file and import it. The program then displays an overview of the media in the Content Manager, which lists all the media and media sections you are using in the project. Double-clicking an entry opens a preview, which provides the option to define the desired section. Next, you can use the toolbar on the edge of the screen to open a first edit. This is the area where you can arrange and cut media, effects, and titles. Now drag and drop the first file from the Content Manager into the editor. The individual tracks will appear there – usually one video and two audio tracks (audio tracks in waveform view). You will see the video and some tools in a slightly smaller preview. You can perform simple cuts fairly quickly here: If you just want to cut a bit from the start and end of a clip, first move the cursor to the start. Then, place a start or in mark in the preview or editor. Next, move the cursor to the position you want to cut the clip. Finally, you can define an out mark (Figure 3). Figure 3: Select the section of a clip you want to use in the editor with in and out marks. You can choose multiple sections of a file. You'll see two delete functions in the editor window: You can either remove the selected area and replace it with "Black" or delete it and leave it to the program to close the gap. The latter proves to be the easiest option in many cases. Conversely, you can add new clips this way, provided you move the other components. You usually only deal with components like the opening and closing credits once the project is mostly complete. In this test, however, I dealt with them first. In larger projects, these steps should be considered the final tasks or be performed in separate edits. In this test, a cut sequence served as a background video for the opening credits. You might prefer to use a still image or a photo, because they are calmer and distract less from the title. If you use a video sequence, optimizing the clip is worthwhile. You can use a simple filter to make the background blurry, so it doesn't distract. An Effects button can be found at the bottom right of the timeline window. The software provides a pretty wide selection of filters. The Blur effect used in this example is in the Video | Stylize section. Drag the filter onto the clip to which you want to apply the effect. The program then opens the Effects editor, which you can use to change the strength of the blur filter, as required. Other filters also provide more options. If you want to customize or remove the effect later, right-click the corresponding section of the video. Effects, the top entry in the context menu, now appears with various options (Figure 4). Figure 4: In the selection of effects, you will see a rough preview applied to the clip in the current cursor position. 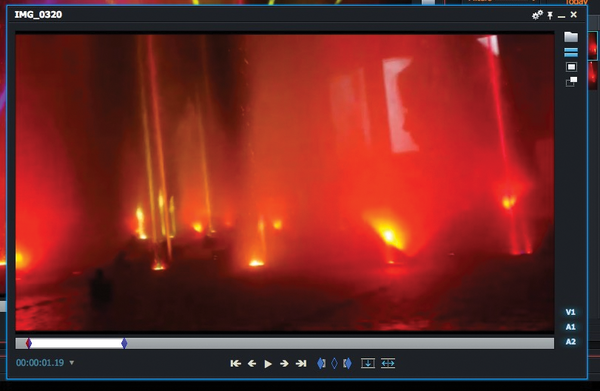 The Lightworks video nonlinear editing program will be released as Lightworks Open Source in the fall of 2010.